Students are not learning, but teachers are told they’re doing their jobs effectively. This oxymoron is not new in American education, but recent teacher evaluation laws were supposed to demolish it by better aligning teacher evaluation scores and student learning outcomes. The problem is: the laws aren’t working as intended. Even with new laws in place, the vast majority of teachers across the country continue to receive a rating equivalent to effective or higher. A new report from the National Council on Teacher Quality (NCTQ) provides a new explanation for the phenomenon. The report reveals that in almost all states, there are teachers who receive an overall evaluation score of “effective” or “highly effective” despite receiving a low score for leading students to academic achievement. This is possible because these teachers receive high scores on other parts of the evaluation such as principal and peer observations, student and parent surveys, and other district and state measures. As NCTQ’s new report details, the guidance and rules that structure states’ evaluation laws allow teachers who receive uneven scores throughout their evaluation to still be rated as effective practitioners — even when data show their students are not learning. Teachers are encouraged to not take responsibility for student learning. Providing teachers with positive overall evaluation ratings despite lack of student learning perpetuates the damaging narrative that when students aren’t learning, it is largely their fault and not the responsibility of teachers and other school-based staff to ensure their success. Teachers are led to mistrust objective measures of student achievement. When a teacher is told by her principal, peers, or outside observers that she is doing her job well, but then student achievement results show her students aren’t learning, she will naturally question the achievement results. State assessments are not perfect, but they do provide an objective glimpse into students’ learning gains and should be taken seriously to evaluate the performance of teachers. If teachers continue to mistrust the results of objective student measures, the debate will continue to focus on the foundational question of the use of these measures instead of moving past that unproductive debate to improve the assessments and how they’re incorporated into the evaluation of teachers. Using teacher evaluation for the purpose of professional development gets complicated. As my colleague Sara Mead and I wrote in our recent report on teacher evaluation, with the passage of the Every Student Succeeds Act (ESSA) and the move toward local control, many policymakers and advocates have voiced support for shifting the focus of teacher evaluation systems from making employment decisions to influencing teacher professional development opportunities. But that won’t be easy. Current evaluation systems built around a small number of observations and little feedback are not likely to contribute much to teacher professional growth. And not only that, it stands to be seen how teacher evaluation systems can be used to productively point out areas of weakness in teachers’ practice if almost all teachers continue to be rated effective or higher. Moreover, it’s unclear what motivation teachers have to take professional development seriously if they are under the impression that they are effective practitioners. 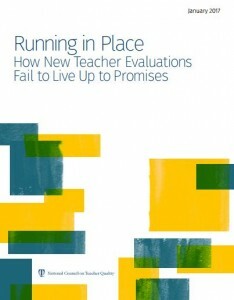 To remedy the issue of misalignment between teacher evaluation ratings and student learning outcomes, among other solutions, NCTQ recommends reforming state rules and guidelines to disallow teachers from earning an effective evaluation if they are found ineffective at increasing student learning. States would be wise to consider this recommendation. However, with the passage of ESSA and less federal attention on teacher evaluation policy than there has been in the recent past, states have fewer incentives to do this difficult, politically challenging work. My hope is that they step up to the challenge for the benefit of students, teachers, and the teaching profession. This entry was posted in Education Policy, Teacher Effectiveness and tagged NCTQ, Professional Development, Teacher Evaluation, Teacher Professional Development on February 1, 2017 by Kaitlin Pennington.